Our weeklong breakdown of each broadcast network’s new fall shows hits the midway point today with ABC. The network slipped to No. 4 last season among 18- to 49-year-olds after an ugly fall in which only two of its five freshman shows survived (most disappointingly, its most-anticipated arrival, The Muppets, attracted large audiences initially, only to subsequently drive them away). ABC did have a breakout fall hit in Quantico, but that wasn't enough to save then-chief Paul Lee, who departed the network in February. For her first fall as ABC Entertainment president, Channing Dungey will be missing one of the network's most important assets after it held Scandal until midseason to accommodate Kerry Washington’s pregnancy. She’s filling the gap with the first Thursday night drama not produced by Shonda Rhimes in two years, a new comedy block on Tuesdays and two new fall shows with real breakout potential, including one that has the inside track to end up as fall’s biggest freshman hit. The plot: A defense attorney (Daniel Sunjata) and a TV news producer (Piper Perabo) team up to create and manipulate big news stories—all of which involve Sunjata's clients—putting their partnership ahead of their respective professional obligations at every turn. Notorious is inspired by the real-life friendship between defense attorney Mark Geragos and Larry King Live executive producer Wendy Walker. The verdict: ABC wouldn’t be ABC without at least one out and out disaster each fall (last season’s Wicked City was canceled after just three weeks), and here’s this year’s entry. Sunjata and Perabo keep topping one another as to which character is more of an embarrassment to their professions. I lost count of the dozens of professional ethical lapses on display here, sometime around the moment that Perabo prepared to broadcast an explosive exposé without for a moment considering giving the person in question a chance to respond to the charges. And their currently platonic relationship will get even sleazier whenever they inevitably end up together. Some of this might be forgivable if any of the characters were vaguely engaging or believable, but they aren't. ABC is hoping Notorious will keep Scandal fans happy until January, but TGIT audiences won't like what they find here. Is it good for your brand? This is a poor substitute for Scandal, so stick to the other Rhimes shows or give Pitch a try over at Fox, which is trying to appeal to women in the same time slot. No matter what audience you’re looking for, there are many better options elsewhere to spend your money. The plot: A brilliant yet wild-child of a lawyer and former first daughter (Hayley Atwell), jailed for cocaine possession, is offered a chance to redeem herself—and keep her mom’s Senate campaign out of jeopardy—by heading up New York’s new “conviction integrity unit,” which will reinvestigate cases in which innocent people may have ended up behind bars. The verdict: For those who loved Atwell in Marvel’s Agent Carter—and there weren’t enough of you, given that the show wasn’t renewed for Season 3—it’s frustrating to see her transition to a far less interesting role on a standard procedural. And while audiences who loved Castle in this time slot for the past eight seasons might be drawn to another procedural, they’ll likely find that the chemistry between Atwell and the D.A. nemesis who brokered her new job (Eddie Cahill) can't compare to the onscreen sparks generated by Nathan Fillion and Stana Katic. Is it good for your brand? If you typically advertise on legal procedurals or Castle, then you'll be fine here. But if you're hoping that the admittedly small Marvel crowd that watched Atwell in Agent Carter will follow her here, don't hold your breath. The plot: Katy Mixon is an unapologetic, average-size mother raising her kids and trying to keep her family sane in hoity-toity Westport, Conn., “where people have big houses and tiny butts.” Then her social status is threatened when one of the only other women in town who's heavier than she is decides to move. The verdict: From Modern Family to Black-ish to Fresh Off the Boat to The Goldbergs, ABC has perfected the modern-day family sitcom. While American Housewife has its moments, the show lacks the sharp comic point of view all of those other ABC hits had out of the gate. American Housewife needs to work harder to harness the infectious comic energy of Mixon, who played Melissa McCarthy’s sister on Mike & Molly. I’ll give it some time, but with nine other comedies on ABC alone this fall (including another new one, below, that is much more assured), it’s on a short leash. Is it good for your brand? It fits right into your ABC family comedy buys, though this is definitely a second-tier show for now. Health-food brands should steer clear, given Mixon’s disdain for them in the pilot (especially green smoothies). ABC's switch from its original, more provocative title, The Second Fattest Housewife in Westport, to the more generic American Housewife should also make it more palatable for brands that wouldn't have wanted to be associated with that word. The plot: Minnie Driver is a headstrong, meddling mom who relocates her family to yet another town in her dogged search to find the perfect spot for her oldest son (Micah Fowler), who has cerebral palsy, while her other kids struggle to fit in again. The verdict: Fall’s most promising new comedy is off to a solid start and earns its place in ABC’s powerhouse Wednesday lineup (The Goldbergs, Modern Family, Black-ish). This is a much better fit for Driver than her last sitcom mom role in NBC's About a Boy. Fowler and the other kids are distinctive and interesting, which is a hallmark of ABC’s best family sitcoms. 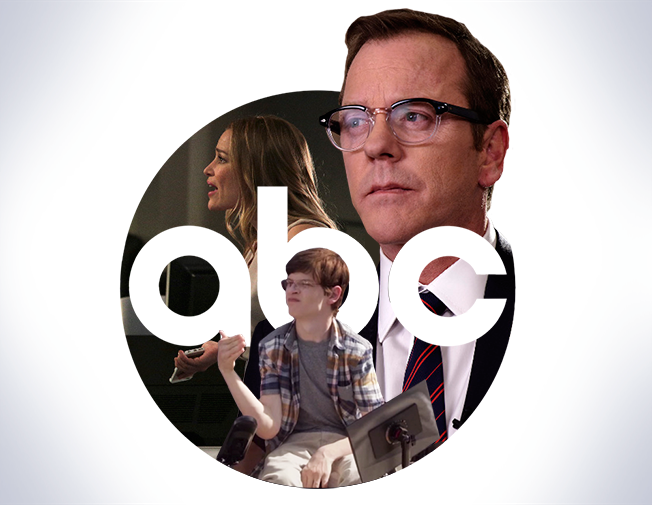 This could be the start of a wonderful friendship, and ABC clearly knows what they have here—the network has already made the pilot available in its entirely online, and via the ABC app, in an effort to hook audiences before next week's fall TV deluge. Is it good for your brand? It fits right in with Wednesday’s other comedies, so yes. Also noteworthy: This is the most prominent scripted TV spotlight a character with a disability has been given since Life Goes On more than two decades ago, which could offer an interesting showcase for the right brand. The plot: The mild-mannered Secretary of Housing and Urban Development (Kiefer Sutherland)—kept away from the State of the Union as the “designated survivor” in the event of an attack—is suddenly named president after the U.S. Capitol is demolished during the event, killing all others ahead of him in the presidential line of succession. He’s tasked with taking on the world’s biggest job, calming a stunned country and appeasing the surviving, scheming White House officials while trying to determine who is behind the horrific tragedy. The verdict: Much like 24 did in 2001, this show combines an irresistible premise with a magnetic star. In short, this is exactly the kind of show a broadcast network should be making to attract a broad audience, and it's ABC’s best shot at a breakout success this season. The network was right to give it such a big show of faith during May’s upfront presentation, where it unspooled much of the first act instead of a standard trailer. The show instantly grabs you, building tension and establishing the stakes, and most importantly, it makes you eager to see the second episode. Is it good for your brand? Absolutely, across the board in almost all categories, more than any other new show this fall—this is fall’s best chance at a breakout hit, in both live and delayed viewing. Plan your buys accordingly, and don't forget that on 24, Sutherland was always happy to partner with brands, even recording on-air messages of gratitude. Sponsors could find a very willing partner in this show’s star, which is something few shows can boast.